My load developement for my new to me 1874 43 Beaumont has started to pay off. I originally purchased twenty formed 50-90 cases to try as well as some of the “43 Beaumont” 380 grain soft cast lead bullets from gunbroker. 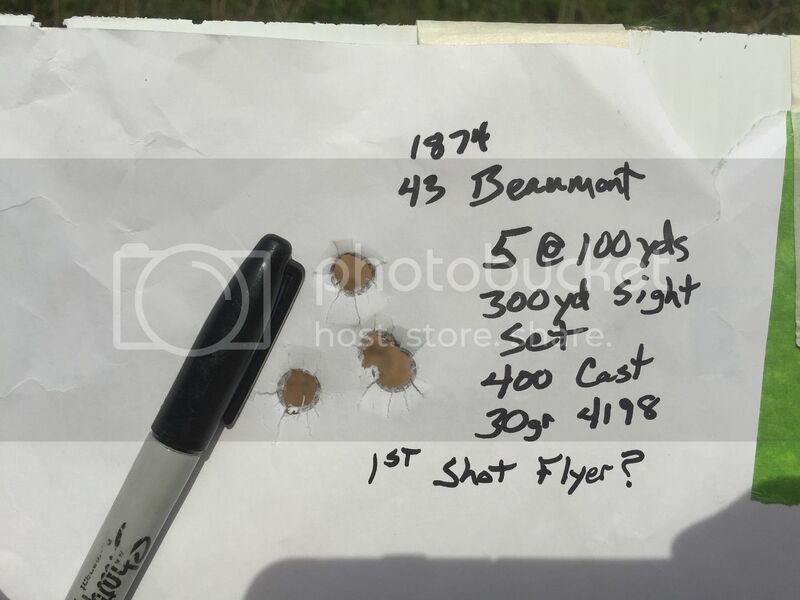 380 grain soft cast “43 Beaumont” bullet and it loaded into the purchased formed 50/90 case. While these did work to adequately fire form the cases, the accuracy with 30 grains of IMR 4198 was appalling with velocity around 1440 FPS. I did some digging and found an old Cramer No. 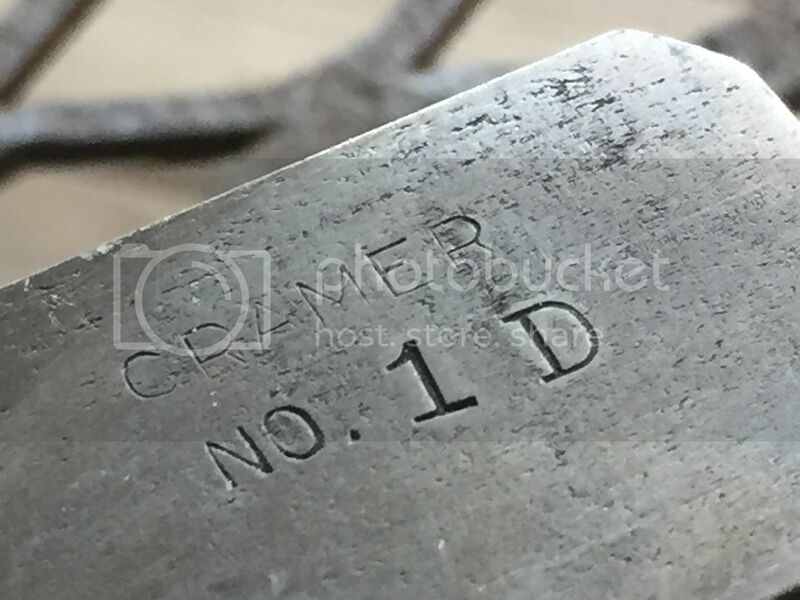 1 D flat point mold a friend gave me years ago and started casting a bunch with 20:1 alloy. Prevent leading hopefully. I sized them to .458 and tumble lubed with X-lox. All my previously fireformed 50/90 cases were neck sized using my 45 ACP Lee factory crimp die which has a carbide insert. 45 Long Colt would work better but I don’t have that one. I used my 458 SOCOM expanding rod to size up the inside diameter of the neck. 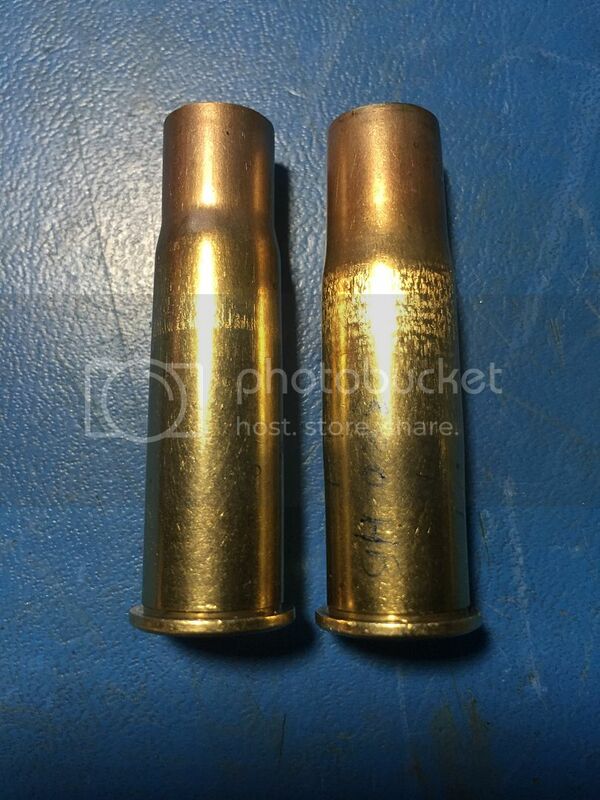 Loaded once fired cases with 400 grain cast Bullet. I had also formed twenty or so new 50/90 Starline cases I bought using my 8mm Lebel Dies and the afore mentioned 45ACP AND 458 Socom dies. These would be getting an initial fireforming. 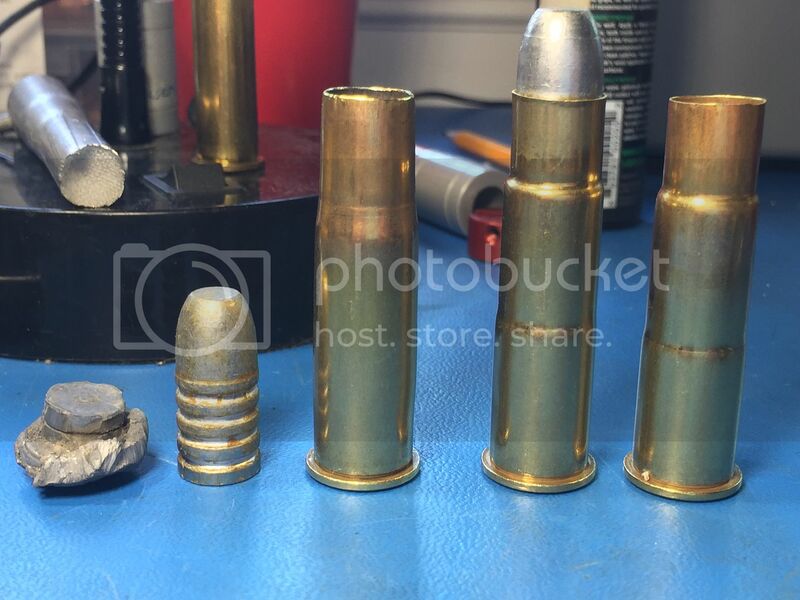 R to L: Lebel die formed 50/90 case, loaded case with 400 cast bullet, case after fire forming, 400 grain cast bullet, recovered mushroomed bullet. 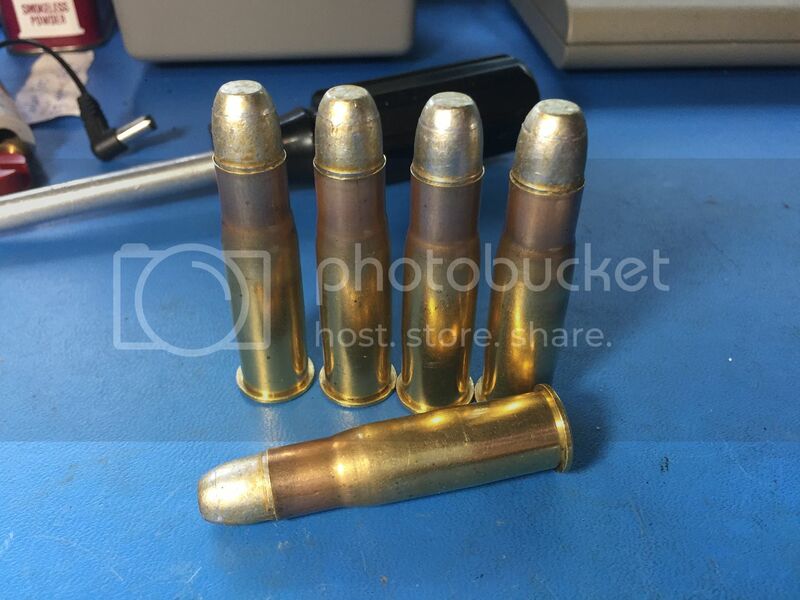 All cases were trimmed to a consistent length of 2.06” and the mouths were flared a bit with the 45 acp flaring die. All cases were primed using CCI 350 Magnum Pistol Primers. I then loaded five of the once fired cases with 30 grains of 4198 and another five at 31 grains. I then loaded the 20 newly formed and unfired 50/90 cases with 30 grains 4198 as well. 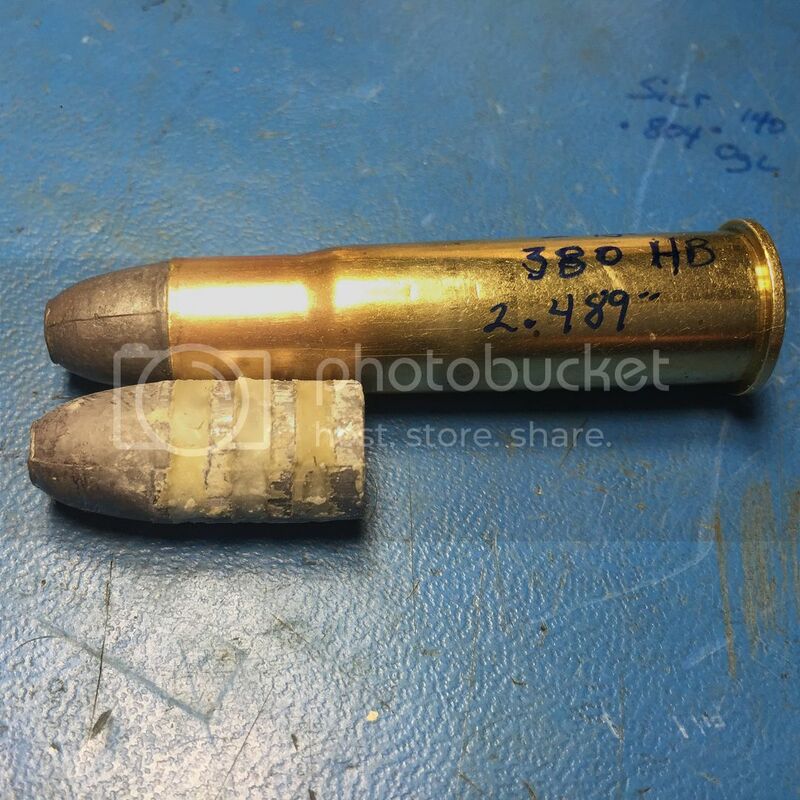 I was able to seat the bullets to a uniform depth by using a wrench handle to act as a bullet depth stop when using my 45 acp seater die.The last step was to run the loaded cases up into the Lee factory crimp die with just a slight “bump” to close down the flared case mouth to the bullet. All shots on paper taken from bench rest at 100 yards. 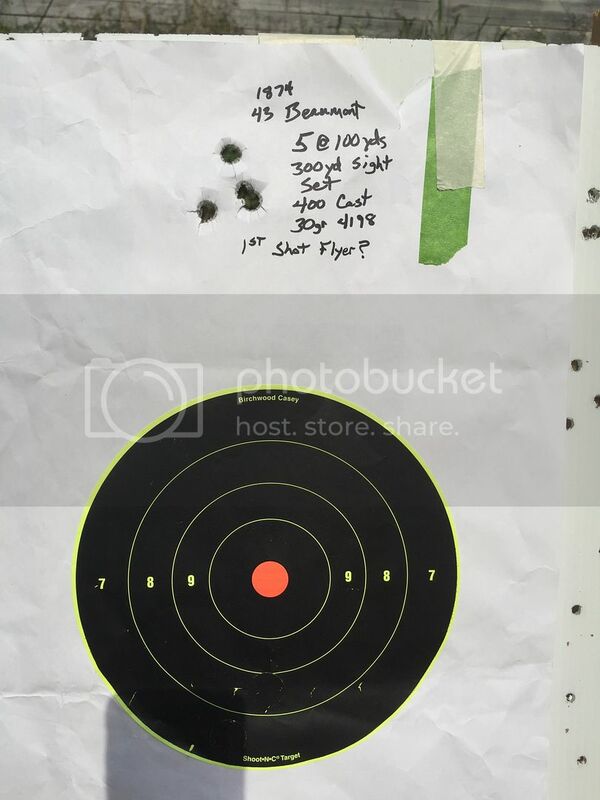 I used 6 o’clock hold on black shootNsee target. Hit about 12” high of POA, at top of target board. 1st round was a flyer, passing just over the top of the target board. But the next four grouped in amazing 1-3/8”! 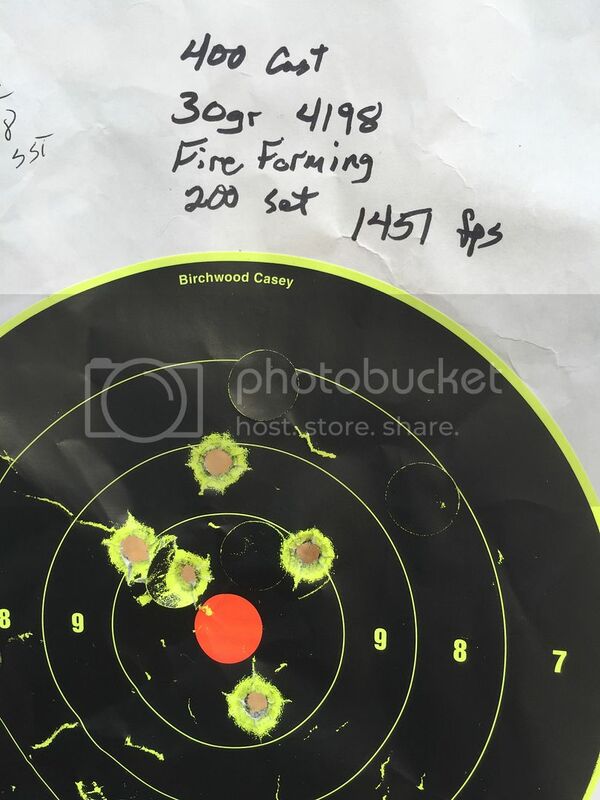 I set my sites down to 200 meter setting and fired the next 5 with 31 grains 4198. Despite hitting down more into the shootNsee target, the group did open up more and I believe the higher velocity caused some minor leading in the barrel. At this point I had about 20 rounds of my fresh formed 50/90 cases that needed fireforming. I decided to see how they grouped on paper for kicks, despite my ugly forming job. I fired two separate five shot groups on separate targets. Both grouped much better than the 31 grain loads, with all shot inside the black bull with my 6 o’clock hold. The first five grouped at about 3” and the second measured 2-1/4”. Average velocity of all ten shots was V= 1453 FPS, SD= 19.1. 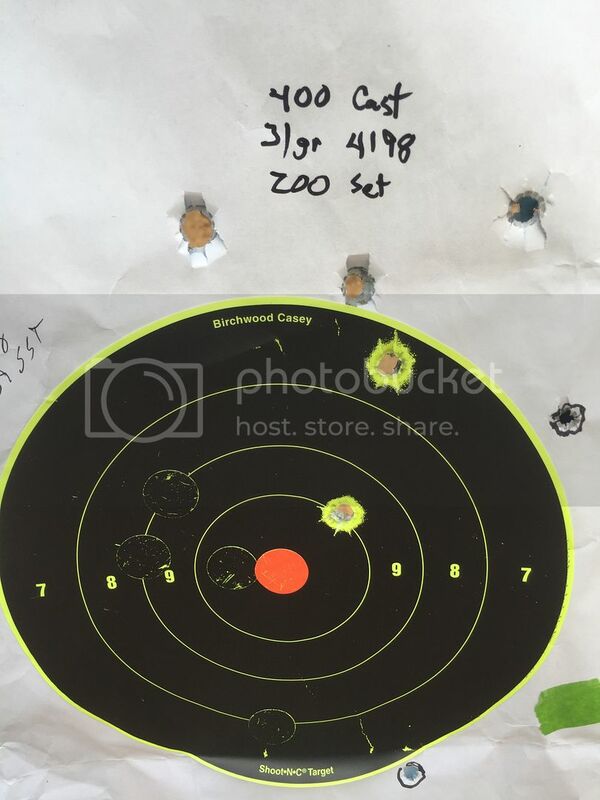 At this point I was satisfied with the grouping and POI of my new loads and decided to just shoot the remaining 10 rounds at a 12” steel plate at the 100 yard line. All ten were fired fro the off hand, site still set at 200 meters. The metal range 9 out of ten times. It was a good end to a good day at the range with the Beaumont. That looks very good. I, too, have formed my brass from 50-90 Sharps. I sprang for the CH4D dies to size them. I have 30 loaded with 55 grains of black powder with 400 grain .459 lead bullets. Waiting for a nice day in central hell (ohio) to take everything to range and see what I have. I'm hoping to be on paper at 100 yards. For me, that's a good day. Now if there are some Tupperware shooters to share the joy of black powder with-that will be a cherry on top! Please let us know how your blackpowder loads work out for you. I’d like to have a usable BP load option for the Beaumont. I just don’t want to deal with the BP cleanup. This question concerns the use of such a small amount of IMR 4198 in my Beaumont loads. The 30 grain load which seams to shoot so well for me leaves a large amount of free space in the case. One manual I’ve read says to use a poly batting to fill the space and hold the powder next to the primer flash hole. IS THIS CONSIDERED AN ABSOLUTE NECESSITY? as my post mentions, I’m getting standard deviations of around 9 FPS. There aren’t any notable signs of pressure spikes and grouping is excellent for this 145 year old rifle. What are the rest of you doing with similar loads? Any suggestions are greatly appreciated. Well, you might as well go ahead and call my name MUD. I called Buffalo Arms. They happened to have a set of 43 Beaumont dies. They cost almost as much as the gun itself, but I bit the bullet and placed the order. Man was that painful. I sure hope I get a LOT of use out of them. Now for the big question. Will the full length resizing die work to properly shape and form new 50/90 cases down to 43 Beaumont? Anyone who has experience doing this, I’d appreciate your input and knowledge. Thanks. First, KneverKnew, you are not MUD! Yes they are not cheap but I thought it was a worthwhile investment. Now to business! I cut down my 50-90 sharps with a cheap, Harbor Freight, mini chop saw. I then used Imperial sizing wax as a lube and sized the cases. After that, I trimmed them down to the 2.06 inch length. I also annealed the cases, just in case as I had a bad experience with some Jamison .43 Spanish brass. Then into the dish washer to clean off the remaining sizing wax. As for filling the case up with some kind of material, I haven't seen any recommendations for this practice when using smokeless powder. With black powder, I use wool yarn that I stuff into the case and cover with a wad to hold it down until I can put the bullet in place. For myself, I am using Winchester large rifle primers as they have given outstanding results in my other black powder rifles. Well I think I have most of what you mentioned as far as items and procedure, except the dies. I cut the 50/90’s down on the harbor freight “chop saw” as you, apply imperial sizing wax, and up till now uused a combo of 8mm Lebel, 458 socom and 45 acp dies and parts to get my initial “formed” cases. Then I fireform them. After that I use just the 45 acp die to neck size. That’s raised an important question. 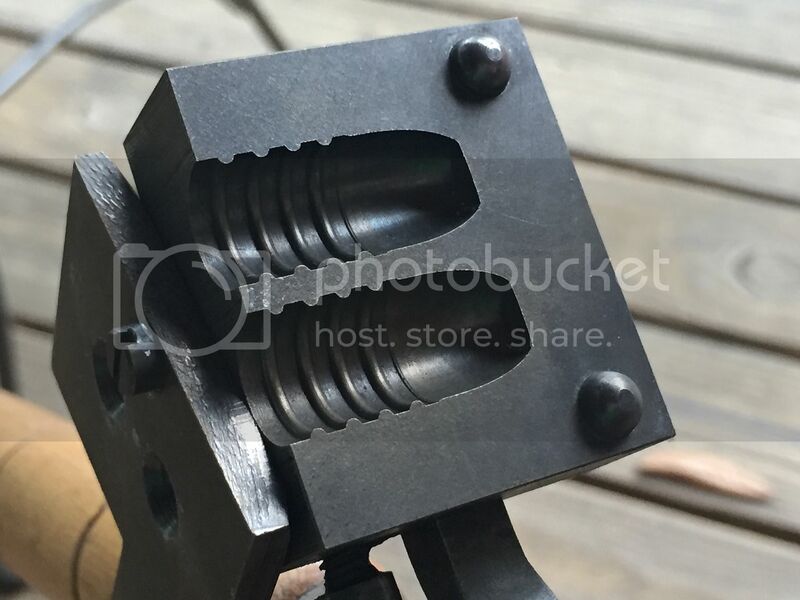 Can the Beaumont sizing die be adjusted such as to allow only neck sizing? I’ve been using CCI 350 Mag pistol primers only because that’s what I was using for my 458 socom. I do have Winchester and other large rifle primers, both mag and regular, I will try. I don't know if you can just neck size with the Beaumont dies. I know of people who do that with other calibers so I presume that it can be done. The CH4D set I bought has an expander die in the set so that isn't an issue for me-fortunately. I know of at least one other person who necks down with .45 amp die and expands with the .458 die so this procedure shouldn't be any problem.